The background on this beautiful card is amazing! I think this is so pretty and love the flower! A great idea too retrieve and colour with the Copics! I love your beautiful blue blossom! Wonderful work, Lynn! 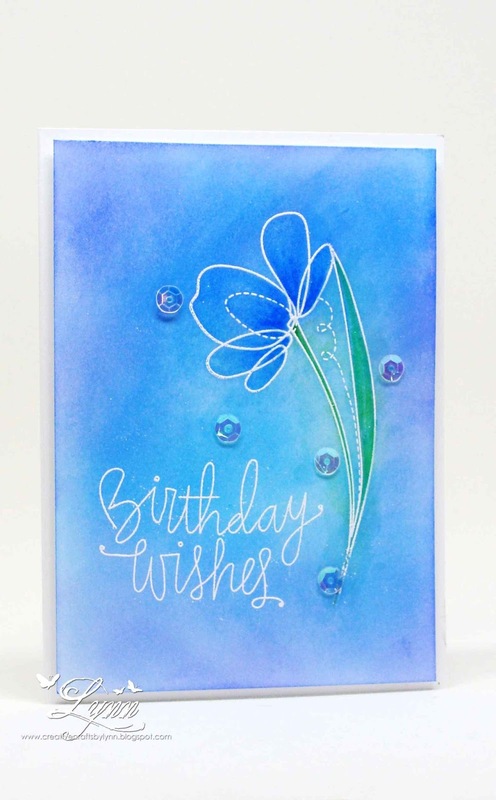 What a great save Lynn, cause this is beautiful..love the blue background and with the white stamping and sequins it is just lovely. Your card turned out exceptionally beautiful! So glad to decided to give it another try, it is very pretty and wonderful colors! I think this is absolutely gorgeous Lynn!! I love all of the blue and that beautiful flower image! What's not to love! It's a brillaint, bold shade of lovely blues! Hope you have a great week, my friend ♥ AND STAY DRY!! You had me at WOW!! Oh my gosh, I love the deep blue color you achieved here, and your friend definitely steered you in the right direction! It's GORGEOUS! What a classy card Lynn - love the way it finally turned out great advice from your friend. I love your card, the blue is so pretty. Can I ask what birthday sentiment you used? The size is perfect. Thank you for sharing. you did amazing on something you dug out of the trash!!! so pretty!! I liked it the first time I saw it and looked again. Still love it! What a pretty flower and that big Happy Birthday is gorgeous! Hope you have a good week too! Lovely card! I wish the cards I throw in the trash looked this good! Glad you dug this out of the trash. It came out spectacular. Hope you find time to rest if only a little bit this week. Glad it came back out of the can.You are being silly. This is exactly the type card that has been winning all of the challenge prizes. I see it as a beautiful winner! I think this is gorgeous! Love the background and the single flower image. I would say this is a pretty impressive throw away card. Glad you saved it.I like blue too. Beautiful! You are inspiring me to get out my distress ink and sponges! I am glad your friend asked you to get the card out of the trash. It turned out to be a real beauty. Funny how hard we can be on ourselves. The flower is very pretty and the blue is too.